Did you know you can now order your Deliveroo takeaway from Babur here on View? 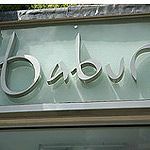 Babur is an Indian restaurant in Forest Hill offering traditional regional as well as contemporary Indian cooking. 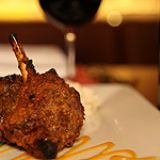 A fully-matched, good value wine list and bespoke Indian cocktails are also available at Babur. Do you work at Babur? Wine matches for all main courses and a broad selection of wines by the glass, as well as a selection of especially good value bin ends. Also an especially strong list of Indian flavour profile house cocktails. What did you think of Babur? Some fascinating authentic dishes from Goa on the menu too, as well as India - worth a visit. 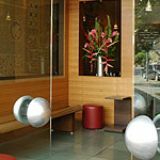 Modern, stylish, Indian: Babur is to restaurants what Sachin Tendulkar is to cricket. Diners are greeted by a large, fierce-looking tiger, but there's no need to fret: the tiger, thank goodness, is stuffed and above the door. Inside things are much cosier, although a traditional curry house this is not. 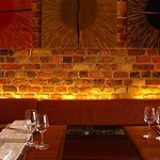 From the exposed brickwork to the handmade wall hangings, Babur is a cut above. Despite the apparent drawback of its railway-carriage like shape, Babur has a fantastic, lively buzz. 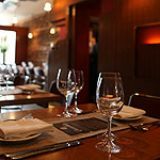 While it’s nice that the staff are so friendly and helpful, the great atmosphere can largely be put down to the restaurant invariably being comfortably full, whether it be Saturday or Tuesday night. One of the delights of the restaurant is the occasional festivals they run celebrating the cuisines of different parts of the Indian subcontinent. Previous festivals have highlighted the food of Rajasthan. That's not to say that you should avoid the main menu, which is full of interesting takes on Indian cuisine. Highly recommended is the Gilauti kebab, a spiced lamb patty, perhaps followed by the magnificent beef Xacutti, a rib of beef roasted in the tandoor and then served in a gravy thick with Goan spices. If you’ve still got room, as they say, you could then have some kulfi (a sort of Indian ice cream). If you’ve still got room after that, you must have a lot of room. One of the best times to visit is Sunday lunchtime, when the Buffet is rolled out. Don’t worry, there are no manky-looking bhajis here, nor does the food sit around getting cold and morose-looking - it is quickly gobbled and replaced. And at under £11.00 a person, it’s a snip. Unusually for a suburban Indian restaurant, Babur has an excellent wine list. There’s a surprisingly good Indian Shiraz and an excellent Semillon from the King of the Barossa Valley, Peter Lehmann. There are plenty of cocktails too, for people who like that sort of thing, plus a slightly less inspiring range of beer. There’s really no need to gild the lily: Babur is a fantastic place to eat high class, good value Indian food.